Bribery, deception and disguise. Figaro needs all his wiles to help the Count out-wit Dr Bartolo and ensure true love wins the day. 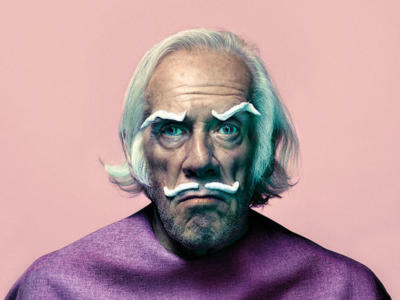 Jonathan Miller’s classic production of The Barber of Seville is a feast of frivolous fun. Enjoy Figaro’s mischievous escapades as he assists Count Almaviva in prising the beautiful Rosina away from her lecherous guardian, Dr Bartolo. Rossini’s comic masterpiece fizzes with memorable melodies in an entertaining production that unites the theatrical worlds of traditional physical comedy and Whitehall farce. Count Almaviva, a Spanish nobleman, is in love with Rosina, the rich ward of Dr Bartolo, an old physician, who plans to marry her himself. Almaviva has followed Rosina from Madrid to Seville, disguised as a poor student called Lindoro. From the street outside Dr Bartolo’s house, Almaviva serenades Rosina, assisted by a group of actors and musicians. Unfortunately, the serenade produces no response from Rosina, so Almaviva enlists the help of Figaro, a barber, who prides himself on his ability to manage the affairs of the city. They realise that they have, in fact, met before, and Almaviva explains why he is in Seville incognito. He is delighted to discover that Figaro is a general factotum to the Bartolo household, who enjoys easy access to the house and gardens. While they are talking, Rosina appears on the balcony with a note for the handsome young student who keeps visiting the house. Despite Bartolo stealing up behind her, she manages to drop the letter from the window and it floats down to Almaviva. Rumours of Almaviva’s interest in Rosina have reached Bartolo ears and he decides he must waste no time in marrying her himself. He gives strict instructions to the servants that while he is out no one should gain admittance to the house. Figaro persuades Almaviva to answer Rosina’s note with a further serenade, but she is interrupted before she can respond. 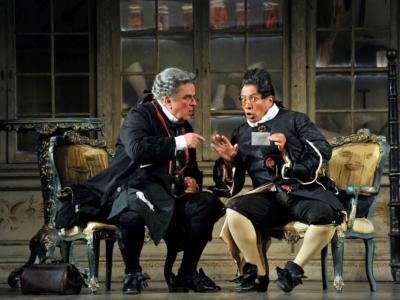 Lured by the promise of money, Figaro devises a plan whereby Almaviva can gain access to the Bartolo household: he must pretend to be a drunken soldier billeted on Dr Bartolo. Figaro has inveigled his way into Dr Bartolo’s home and managed a brief meeting with Rosina before Bartolo appears and expresses his annoyance at Figaro’s constant disrespect towards him. He questions Rosina about her meeting with Figaro, as well as interrogating the servants. 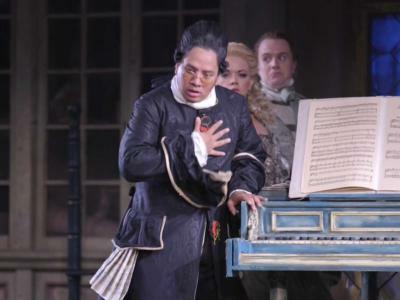 When Rosina’s singing teacher Don Basilio arrives, Bartolo brings him up to date on the situation with Rosina. Meanwhile, Figaro has overheard Bartolo and Basilio’s conversation. He starts to prepare the ground for ‘Lindoro’, but soon realises that the wily Rosina is already ahead of him. Bartolo suspects Rosina of writing a letter to ‘Lindoro’; when she protests her innocence, he warns her not to trifle with him, advising her to find more plausible excuses for a man of his standing. Almaviva, now disguised as a soldier, arrives to take up his ‘billet’ in Bartolo’s house. Rosina is of course delighted when he reveals that he is really her secret admirer. Bartolo’s annoyance at Almaviva’s drunken behaviour causes such a row that the militia are called by the neighbours. The Count, however, narrowly escapes arrest, much to Bartolo’s annoyance. Assuming yet another disguise, Almaviva enters the house as Don Alonso, a music teacher who says he has come to give Rosina her music lesson in place of Don Basilio, who, he claims, has suddenly fallen ill. To gain Bartolo’s trust, Don Alonso reveals that he has intercepted a note from Almaviva to Rosina. Bartolo fetches Rosina for her lesson. While Bartolo dozes, Rosina and ‘Lindoro’ express their love and make plans to elope that night. Figaro arrives to shave Bartolo. He manages to steal the key to Rosina’s balcony and lures Bartolo away from the music room by smashing a pile of crockery. All is going to plan until Don Basilio unexpectedly appears, but Figaro quickly pays him off and Basilio withdraws. Figaro resumes shaving Bartolo, and tells Rosina of his plan for the lovers to make their escape. Bartolo, however, has not been entirely duped, and penetrates Almaviva’s disguise. The game is up for the lovers – albeit temporarily. Berta, Bartolo’s servant, ruefully comments on the foolishness of old men wanting to marry young wives. When Bartolo discovers that Basilio has never heard of Alonso, he decides to marry Rosina without delay. He confronts Rosina with a letter she addressed to Lindoro and catches her by surprise when he makes out that Lindoro is clearly acting on Almaviva’s behalf. Following a violent thunderstorm, Figaro and Almaviva climb into the house by way of a ladder and an open window. They are confronted by Rosina who is angry at being ‘used’ by Lindoro – until she learns that he is in fact Almaviva and falls willingly into his arms. Figaro is anxious for the lovers to be off, but they discover they are unable make their escape because Bartolo has removed the ladder. Basilio returns with the notary who is ready to marry Rosina to her guardian, but a bribe and threats easily persuades Basilio to witness instead the marriage of Rosina to Almaviva. Bartolo and the magistrate appear too late and he is obliged to acknowledge he has lost Rosina.